QRU is a family of products that create and read QR Codes. We believe it can and should be used by common people to automate small tasks in their daily lives. We follow the lead laid out by people who were into QR Codes before us but at the same time we innovate as required in pursuit of our goal to use the QR Code as part of our daily life. 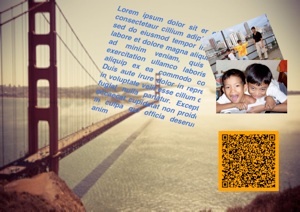 If you are interested in the iPad product QRU HD tap on the sample post card (above). The rest of this page is dedicated to the iPhone and iTouch products which started all of these. QRU 2.2 comprise of several bug fixes including a major one that disallowed saving of scanned VCards and Me-Cards to the address book in v 2.0 and 2.1. The feature has since been enhanced to allow replacement or merging of records instead of simply adding a new one. Furthermore, when creating a contact card, we have incorporated a new option that allows you to save whatever updates you make into the existing contact record. There is a fix with the passwords and several others related to appearance and visibility particularly after the pdf card is generated. The manual option of scanning now use the native IOS camera interface which allow on the fly switching from the front to the rear camera. The move from v 1.0 to 2.0 had a handful of unexpected surprises that were not addressed immediately as we were preparing for an iPad release (QRU HD should be available concurrent with this version). For QRU (not available for QRU Mini), we introduce colored QR Codes. Tap the generated QR Code and it will bring you the view below. Simply click on your preferred version to print or share standalone or within one of QRUs documents or cards. on black QR Codes) when the image is read from the photo album or imported from email or a 3rd party app. It will not decode when using the camera. This capability is not part of the official QR Code ISO documentation and is not supported by majority of the available Software development kits including the one that QRU use. WhatsApp recently released a more functional URL interface. QRU we have modified the app to put in full support for whats app users. You can select a contact person to create a whatsapp QR Code. Upon scanning, the QR Code will search for the person in your contacts. If not present, the app will prompt you if you want to create the contact or contact number within an existing contact then proceed with opening a chat session with the person. QRU has an option to allow sharing of the QR Code with other users through a whatsapp chat session. 2.Skype - Skype IOS supports video and voice calls only, the current version of Skype IOS do not support Skype Chat, nor any form of user initiated conference calls. 3.Facebook chat - FB - Messaging! 4.Tweet Me - This is a link to the users profile page where the receiver can follow the user. 5.WhatsApp - Current version of WhatsApp simply transfer control to the app. This will be enhanced as WhatsApp 3rd party interfaces are upgraded. The new action types are available as part of the compound QR Code feature and are usable as stand alone QR Codes, within a QRU business card or to supplement a QRU Postcard. QRU 2.1 resolves some bugs introduced with 2.0. QRU 2.0 cleanup inadvertently affected the apps import capability. QRU 2.1 resolves this problem aside from introducing new features and enhancements. Previous versions of QRU do not handle missing middle names, or first names properly introducing “(“ in the middle initial for example which needed to be cleaned up by the user. This is already fixed. QRU 2.1 also resolved a bug that prevents QRU 2.1 in starting up in an iPad in iPhone compatibility mode. Other reported issues are facebook related and a small problem when playing youTube Videos inside the QRU Postcard Viewing window. These are like wise fixed. 3.Learning mode dialogs were shortened from the wordy original. 1.Neither the Apple email app nor Dropbox, nor Evernote allow image files to be imported by image file importing programs whether QRU or other photo handling apps. Available options only list saving to the camera roll, posting to Social Network Apps and email. The use of a proprietary file format for QR Codes (QRC) is still a requirement to facilitate direct transfer between the apps, email and QRU. 2.QRU use UTF-8 encoding as a default, this allows support for multiple languages and emoji/ emoticons. 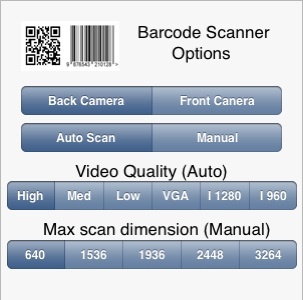 QRU, the full product, has options to allow native QR Code encoding to be used and one of them is the Alphanumeric character set as initially used by Code-39 barcodes. The character set support 43 characters (0-9), (A-Z capital letters only), and (-, ., $, /, +, %, and space). Using this option boost the capacity of the QR Code to 4,239 characters. 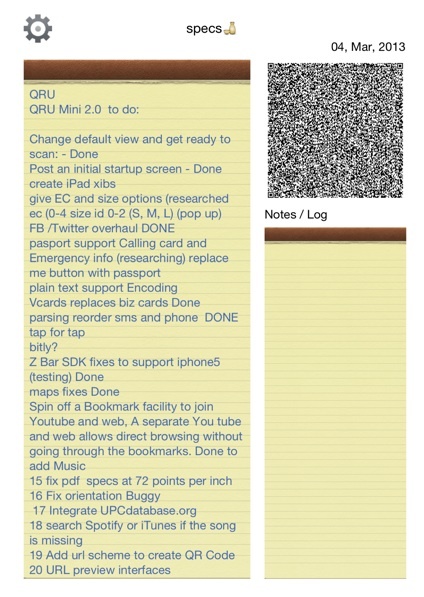 QRU 2.0 is a major overhaul of the app after several months sabbatical from coding. It contains at least 25 new features and several bug fixes related to parsing. 1.Surf and QR Code - The initial version works exclusively by surfing and bookmarking, QR Code are then generated from the bookmarks. The new version will allow direct generation of QR Codes from surfing (as well as from the bookmarks). This is true for both Youtube and URL Options. Code! A new option allows you to directly create QR Codes while playing from a playlist. The music player facility has been present with QRU 1.0 . Version 2.0 brings a sleek interface to create QR Codes. 3.Missing songs generate an internet search for the song, instead of just being told that you do not have it. 4.QRU Compound QR Code allows mix and match of up to 10 QR Code action items in one QR Code. 5.QRU postcard redesigned with new interface to plug in additional action items. QRU compound action items was actually designed to make the QRU postcard interface better. 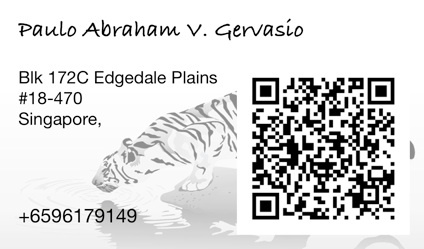 compound QR Code with the business card. 7.PDF files are generated in 2 scales, the previous version created PDF files formatted for the screen (size wise). Version 2.0 generates a second scale that prints directly to paper in the correct size. 8.Support for (Marketing Campaign) Analytics using Google Analytics. QRU generates the necessary Analytics parameters in your URL to allow you to track the usage of your QR Code campaign. 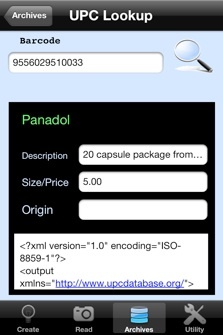 9.New UPC / Product Barcode lookup with www.upcdatabase.org supplements v 1.0 access to www.upcdatabase.com. The new facility does not require individual membership. Adding new products are a cut paste affair to a mobile website, slightly harder than with the upcdatabase.com facility. 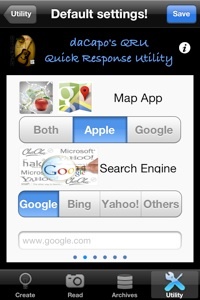 10.New Map options allow you to select Apple Maps, Google Maps or both. 11.User definable default Search Engine allows you to select from Google, Bing, Yahoo or even define your own (e.g Weibo for China). 12.Full A4 page generation for Instructions/ Setup QR Code. 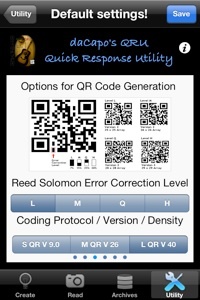 13.QR Code settings for Reed Solomon Error Correction and size options. 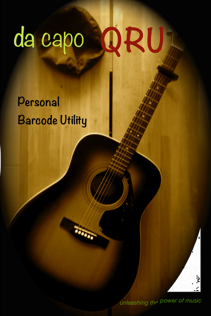 compliant characters (including emoticons) in the barcode (Full UTF-8 Coding) QRU v 1.0 complies with the default Latin1 coding only. 15.Support for native QR Code encoding . Numeric, Alphanumeric and Kanji. 17.new options to allow Full HD scanning and support for v40 QR Codes, you may scale back to other resolution video quality to boost performance. 18.Manual scanning options to allow bigger image sizes, zoom facility particularly for older iPhones. 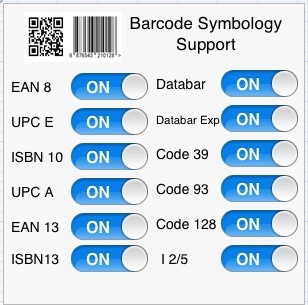 20.Full support for 12 1D GS1 compliant barcodes and QR Code with an option to selectively turn off support for individual barcode types for performance reasons. 22. iPhone 5 retina screen support. 23. Full HTML 5 help. 24.Option to start with the Create or Scan Page when opening the app. 25.Learning Mode option guides new users in picking fields from the address book, the calendars and using QRU in general. 26.PNG output create a separate PNG output file that can be imported to imaging apps such as Vintique and used to create Qr Code Art. With QRU 2.2 QRU has incorporated photographic filters that allow sepia and a variety of color effects to color the QR Code (see above). These are not as sophisticated as those found in Vintique but they should be enough for the majority of applications. There are several other smaller fixes & enhancements include numerous changes to the parser particularly for the SMS, phone, the MeCard, VCard action items to conform with more universally accepted parsing formats. Replacement of icons, Some changes in the Password facility. The changes are all backward compatible with QRU v 1.0.